Mike Gorodinsky Wins Event #5 Omaha/Seven-Card Stud Hi-Low 8-or-Better ($216,988)! Three days ago, 374 of some of the best poker players in the world walked into the Rio with hopes of taking down the first mixed game event of the summer, Event #5: $2,500 Omaha/Seven-Card Stud Hi-Low Eight-or-Better. By the beginning of Day 3, only 19 still had a shot at the bracelet, and after nearly 12 hours of play, that lucky player was Mike Gorodinsky. He will take home $216,988 to go with it, and the pride of knowing they beat one of the toughest fields at the Series. Bracelet winner David “Bakes” Baker was the first player eliminated from the day when he couldn’t catch a straight or a low draw on seventh street in stud-8 against the trip kings of Kristopher Tong. From there, the field lost James Van Alystyne in 18th, David Levi in 17th, Ralph Perry in 16th, and Andrew Kelsell in 15th Place. After those eliminations, we lost one of the most notable names in all of poker, Mike Matusow. Matusow busted in stud-8 in a sick cooler. He made a seven-high straight on seventh street, which was good for a high and a low. However, George Danzer had an eight-high straight, and Owais Ahmed had a seven-five low, rendering both Matusow’s high and low useless, and busting him in 14th place. From there, there were four eliminations in a matter of 10 minutes to get us to the "unofficial" final table. One of those was five-time bracelet winner Daniel Negreanu, who bowed out in 12th place. After being knocked down to just 40,000, Negreanu got it in good in Omaha-8, but got sucked out on the river by Gorodinsky. After losing Alexander Lakhov in 11th place, and Roman Verenko in 10th, we quickly reached the "unofficial" final table of nine. It didn’t take long to lose the first two players. 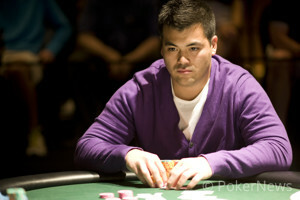 Dustin Leary bowed out in ninth place in stud-8, and it was Tong who did the deed. Tong made trip aces on sixth street, and Leary was drawing dead. A few hands later, Julie Schneider found herself all in out of the big blind in Omaha-8. On a board that read , Matthew Ashton held a monster with in his hand for a full house. Schneider revealed her cards one at a time, and never came close to beating Ashton’s boat. Schneider walked away with a shade under $20,000. Half an hour went by before Mack Lee lost in seventh place. Lee got the rest of his money in on fourth street in stud-8 with a pair of deuces, but he was behind the kings of Tong. Tong never let go of the lead, and scored the knockout to get things down to six players. George Danzer made quite the impressive run, making the final table of this event in back-to-back years after finishing runner-up last year. However, he wasn’t able to best that performance, as he was our sixth-place finisher. Danzer also busted in stud-8 when his pair of sevens and four to a low couldn’t catch up with the trip fives of Ashton. 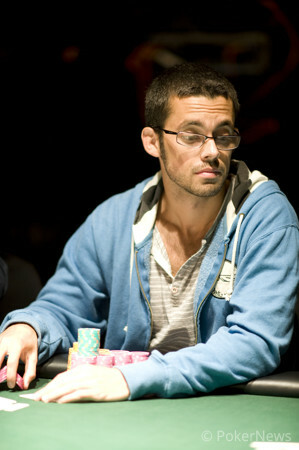 Play was five-handed for over two hours before it losr George Fotiadis in fifth place. Fotiadis was as low as 15,000 at one point, before battling back to 400,000. However, he once again got whittled down, and met his end in Omaha-8 when he couldn’t beat the seven low of Ashton, and the seven-high straight of Gorodinsky. Ahmed, the winner of this very event in 2011, fell in fourth place at the hands of Tong. He secured $62,631 for his efforts, and then Ashton went out in third for $86,437. When heads-up play began, it was Tong who held the chip lead. Gorodinsky had so often been on top of the counts throughout this event, but he soon fell very short against Tong and was battling for his tournament life on many occasions. Eventually, Gorodinsky ran his stack back up to take the chip lead. After some back-and-forth battling from there, Gorodinsky chopped Tong down pot after pot before finally finishing him off. On the final hand, Gorodinsky made a straight in a hand of stud-8 to bust Tong in second place. For his finish, Tong took $$134,017. Kristopher Tong was down to just three big bets when the two got the money in on fourth street. The dealer sent the cards out like rapid fire, and when Gorodinsky caught the straight on sixth street, Tong was drawing dead. Neither player revealed their final down card. Tong held the chip lead when we started heads up, but he will have to simply wonder what could have been, as he bows out in 2nd place. Kristopher Tong raised from the button, Mike Gorodinsky reraised from the big bling, Tong made it four bets to go, and Gorodinsky called. The flop came down , and Gorodinsky checked. After Tong bet, Gorodinsky check-raised. Tong called. The turn was the , and Gorodinsky bet. Tong raised, and Gorodinsky made the call. The river completed the board with the , and Gorodinsky bet. Tong called. Gorodinsky showed the , and Tong showed the . Gorodinsky's hand was best, and he won the pot to knock Tong all the way back down to 215,000 in chips. Mike Gorodinsky has absolutely dominated this last round of stud-8, so much so that he has now taken the chip lead. 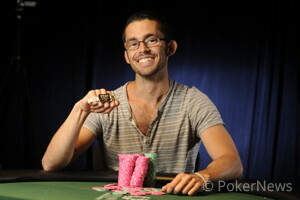 In the first hand, Kristopher Tong brought in, and Gorodinsky raised it up. Tong then three bet it, and Gorodinsky called. On fourth street, Gorodinsky fired out, and Tong called. When Gorodinsky bet fifth, Tong shook his head, revealed in the hole, and folded his hand. 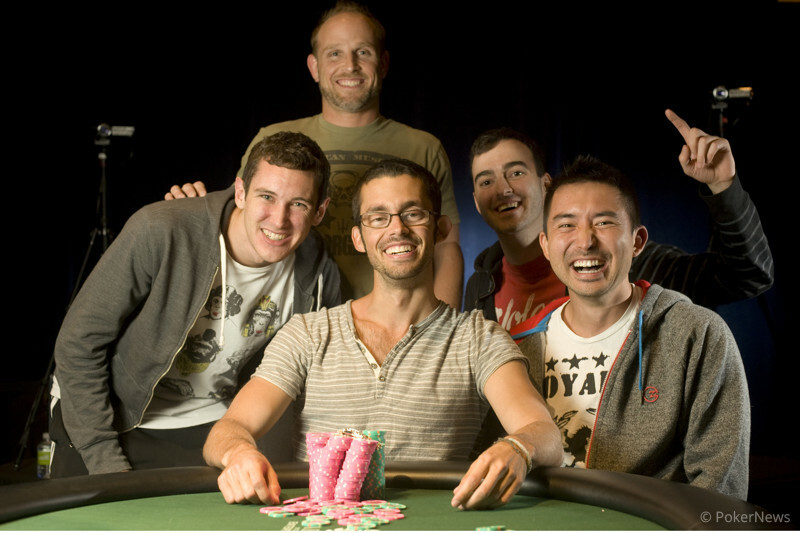 A couple of hands later, Tong brought in, and Gorodinsky raised it up. Tong called, and checked on fourth street. Gorodinsky fired out, and Tong check raised him. From that point on, Tong bet out every single street, and Gorodinsky called him down the whole way. When he was called on seventh, Tong simply gave up, mucking his hand without showing. 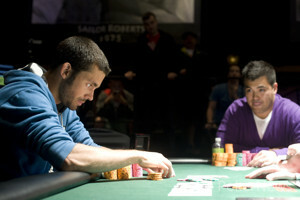 Gorodinsky scooped the pot, and after that one, he has now taken the chip lead with 1.525 million. From the button, Kristopher Tong raised. Mike Gorodinsky made the call from the big blind, and the flop came down . Both players checked. The turn was the , and Gorodinsky bet. Tong called. The river was the , and Gorodinsky bet. Tong folded, and Gorodinsky won the pot. Two hands later, Tong limped the button, Gorodinsky raised from the big blind, and Tong called to see the flop come down . Both players checked. The turn was the , and Gorodinsky fired a bet. Tong put in a raise, and Gorodinsky made the call. The river then completed the board with the , and both players checked. Gorodinsky showed the , and Tong mucked. With these two pots, Gorodinsky has moved back to nearly one million in chips. Mike Gorodinsky called on the button, and Kristopher Tong raised it up. Gorodinsky called, and the flop came down . Tong bet out, and Gorodinsky called. The hit the turn, and this time Tong check called a bet. The river was the , and both players checked. Tong grimaced, and table for the nuts. Gorodinsky shook his head and mucked, dropping him back down to 400,000. Kristopher Tong brought in, and Mike Gorodinsky raised it up. Tong made the call, and Gorodinsky proceeded to bet the entire way. Tong called all the way until the final card, when he reluctantly folded, giving the nice sized pot to Gorodinsky. After that one, Gorodinsky has battled back to 720,000. On third street, Kristopher Tong brought in, Mike Gorodinsky completed, then Tong raised. Gorodinsky called. Then on fourth and fifth street, Gorodinsky check-called a bet from Tong. On sixth street, both players checked. Gorodinsky then check-called a final bet from Tong. Tong showed the from the hole, and Gorodinsky mucked.